Conventional drapery cleaning is usually a time consuming task which requires a lot of effort and doesn’t necessarily yield the best results when done at home. Any person who knows a thing or two about washing heavy curtains or drapery will be aware that sticking these fine fabrics in the washing machine, as advanced as it may be, is hardly the best way to clean them and achieve good results. Conventional washing of drapery will usually result in almost permanent creasing, discoloration around edges and folds and possibly even washing powder stains from improper drying. In order to avoid this it is recommended to use professional grade drapery cleaning to save the fabric from all that can go wrong. Our expert cleaning technicians will review the fabric and the condition of the drapery in order to apply the most effective and sparing cleaning method. If you think that drapery doesn’t need to be cleaned on a regular basis, think again, because such large size, heavy fabrics are a favorite spot for dust mites and household bacteria which inevitably accumulate over a period of time and become a problem for asthma and allergy sufferers. Drapery cleaning is a delicate process and in order to yield the best results with no chance of damage it is carried out by our attentive cleaners. They will approach the task with undivided attention and apply the right cleaning technique. We can assure our customers there will be no drapery shrinkage after our treatment is done, unlike conventional cleaning where shrinkage is almost certain. Please keep in mind that sunlight damage and other permanent staining will not be subject of the cleaning process as it is irreversible and even the most aggressive cleaning approach will only further the damage. Our drapery cleaning is performed by trained cleaners using professional grade equipment which leaves no residue or smells once the treatment is over, drapery will be dry and ready to use. 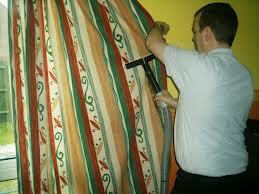 The drapery cleaning service is available with flexible appointment hours for extra customer convenience. Draperies are heavy fabric curtains used to shield the room effectively from sunlight and nosy neighbors, but they are also quite a problem to wash and keep clean due to their large size and weight. Conventional drapery cleaning is usually a time consuming task which requires a lot of effort and doesn’t necessarily yield the best results when done at home as machine washing the drapery is not a very good idea. Such cleaning attempts usually result in almost permanent creasing, discoloration around edges and stitch lines and possibly tearing and washing powder stains from improper drying. In order to save your fine draperies from all the things that can go wrong with cleaning we recommend you use our professional drapery cleaning service. The cleaning is performed by properly trained technicians with sufficient prior experience and knowledge; they will review the state of the draperies and decide upon the best way to clean them without causing or furthering any damage already sustained by the draperies. Although draperies may not look worn or dirty, they are actually one of the biggest dust collectors around the room as such heavy fabrics are an ideal spot for many dust mites and bacteria to grow and multiply so cleaning them professionally every so often is a good idea, especially if you have asthma sufferers or other allergy prone individuals living at the house. Drapery cleaning is a serious task and our attentive cleaners will approach it with due attention and professionalism, they will apply the right cleaning method and strive for the best results possible, there will be no shrinkage or discoloration of the fabric which is an almost certain downside of conventional cleaning. Please keep in mind that sunlight damage and other permanent staining will not be subject of the cleaning process as it is irreversible and even the most aggressive cleaning approach will only further the damage. The drapery cleaning is non-toxic and leaves no traces or residue in the fabric itself or the room. Customers can have the cleaning done seven days a week with flexible appointment hours. Draperies are usually heavy fabric curtains which span the length of the window. They are great when you need to block out the sun or your neighbors from across the road, but are real pain when they need to be washed and cleaned due to their size and weight. Most people would have attempted to clean and wash heavy draperies the conventional way – in the washing machine or by hand for example. In the machine wash case you end up with crunched up, permanently creased, faded or otherwise damaged set of draperies which are now a bleak reminder of what they used to be. In case you tried to wash the draperies by hand, two things are certain – you get sore hands for a week and the draperies get nasty washing powder stains from improper drying. Doesn’t sound too great, does it? We don’t think so either, this is why we offer customers top level, professional grade drapery cleaning without risk of any damage or improper treatment of these fine fabrics. Our cleaners will come fully equipped and ready for the job, there will be no need to take the drapery to another location as the entire cleaning procedure is carried out on site. The cleaners are specially trained the asses the staining and damage on the drapery and determine the most appropriate and sparing way to clean it. There will be no shrinkage as a result of the professional cleaning session, whereas shrinkage is almost certain when washing drapery in the washing machine. Customers should be aware that sunlight damage and permanent staining cannot be reversed even by professional cleaning. Some people might think draperies don’t require much cleaning like the carpet does for instance, but such heavy, thick fabrics are a favorite spot for dust and bacteria, especially in rooms with poor ventilation and lack of enough sunlight. Our cleaning systems leave no residue or smells in the fabric itself or the rest of the room, all materials we use are non-toxic, environmentally friendly and pose no health risk to humans or animals.